I was lucky enough to have a chance to interview the author in greater detail about some of the overall themes of his book, particularly whether the impetus for writing it was to share new themes and techniques, or to wake up the market to the frequent mistakes they were exhibiting. Rohit Bhargava is the Senior Vice President, Digital Strategy & Marketing at Ogilvy Public Relations. Surly Beer does not have a blog and the beer they produce â€“ whether by the bottle, can or jug â€“ is just beer. Great beer, but just beer nonetheless. What they have done an excellent job of however, is act and position themselves in a way that has quickly cultivated a corporate personality allowing a remarkable and rapid connection with an already oversaturated marketplace. Guy Kawasaki illustrates in his foreword to Bhargavaâ€™s book that itâ€™s not enough anymore to produce something great, rather, an absolute necessity to create something â€œinsanely great.â€ Otherwise, you are simply pushing your great product out into the market flush with other great products. The methods for cultivating a personality shared in Bhargavaâ€™s book, while applied here to corporations, can apply in equal respect to the personalities of other large entities. In the interview with Bhargava, he pointed out the example of China, in particular how they are dealing with the world around human rights issues and the Olympics. Doing the right thing is, luckily, a logical starting point for any company, country or person struggling with the idea of how to cultivate a personality â€“ and in the end – when boiled down to its basic elements, cultivating personality is one of the easiest things in the world to do. Unfortunately, the exact same can be said of golf. (For those of you reading locally in Minnesota by the way, is the spring fever obvious enough in this post so far?) The power of Bhargavaâ€™s book stems from its ability to make high level marketing themes instantly relatable through exercises, case studies, and pop culture analogies ranging from The Simpsons to Fletch Lives – from Die Another Day to Star Trek: The Next Generation. In Chapter 1, “faceless” used to work because big meant credible. This no longer works. Simply put, large corporations, whoâ€™ve based their past success on metrics like price point, rather than relationship cultivation will soon be staring into the face of a rapidly moving new market they can no longer comprehend enough to tame. As it relates to golf: Forget everything you thought you knew about how your body is supposed to move and prepare yourself to learn something entirely new. Chapter 2 discusses how accidental spokespeople are speaking for your brand. Embrace them. As Subway learned when it found Jared, the people and elements that will shape the story of your companyâ€™s personality are likely already out there â€“ you just have to listen. As it relates to golf: The elements that will shape your game are already swarming you â€“ from the hush of the wind in the trees to the babbling brook of approaching water, to the seemingly nonsensical tips of a friend who barely graduated kindergarten but can somehow drive the ball 300 yards. Nothing can afford to be ignored. In Chapter 4 we find that backstories establish a foundation of credibility. You need one. Surly Beer has been around less than two years. But there is a real, personifiable story behind its creation. There is for every company. If you think yours is the exception, your targeted customers most likely will, as well, and choose to spend their time with someone a bit more interesting. As it relates to golf: If there simply is nothing new you can learn from a golf partner after walking the course for 3 hours together, shouldnâ€™t you find a better one. What we find in Chapter 5 is that fear of change leads to barriers. Finding your authority overcomes them. If NBC were a chubby little kid and old Saturday Night Live clips were bits of inexpensive â€“ yet delicious â€“ candy he refused to share – how would you feel about that kidâ€™s personality? Now, go out to YouTube and conduct a search for Will Ferrell + Robert Goulet. How do you feel about NBCâ€™s corporate personality? As it relates to golf: Youâ€™ve never had any trouble getting out of the bunker and see no reason youâ€™ll ever have to adapt to an alternate club or swing. Well what happens when they start using sand so soft it might as well be from Venus?Adjusting your game to adapt to changes in your environment may be frightening, or at the very least, frustrating. However, it is this ability to adapt that helps shape our personality as people and our companyâ€™s as personifiable. Of course, sharing themes is only one half of the battle â€“ and also almost exactly one half of this book. Itâ€™s second half is stunning in that it exists as a virtual how-to guide sharing new, yet proven, marketing techniques that can turn even the stodgiest, faceless corporations into the next corporate darling â€“ seemingly overnight. Karmic Marketing â€“ or doing something good without asking for a reward. In other words, allowing users to upload Will Ferrellâ€™s Goulet sketches from SNL simply because they â€“ shocking concept â€“ make your customers happier. Antimarketer Marketing â€“ or making fun of traditional marketing techniques in general to prove you are above it all. An excellent example shared in the book is that of Axe body spray and body wash that irreverently plays up its own image in each new campaign that lets us play along with the joke that all a man needs to land the girl of his dreams is to exude the scent of â€œViceâ€ or â€œGrooveâ€ or â€œKiloâ€. Fallibility Marketing â€“ or playing up your own mistakes to build a personality. Position the logos of each of the major airlines to launch a blog recently onto a dartboard â€“ and I can nearly guarantee that each was launched in the spirit of this technique.In the conclusion of my conversation with Bhargava, he commented further on the idea of fallibility marketing by citing another excellent example pertaining to server downtime. Much like dealing with a flight delay, server downtime will never be something customers will be happy with, but it is something understandable and it is ideally infrequent. However, unlike flight delays, server downtime issues are something most companies have the power to clearly communicate reasons for, if they are a planned occurrence, well in advance.In this sense, the idea of fallibility marketing blends with the traditional project management technique of simply managing expectations. Done properly â€“ companies can exhibit an even stronger personality by transforming what could be considered a mistake if not communicated, to a clearly thought out plan implemented for the customerâ€™s benefit. Taken to its next level, this could encourage customers to tell others how responsive and well organized your company is â€“ providing an even stronger marketing opportunity. 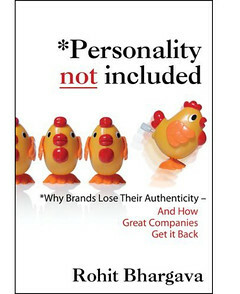 In the end, â€œ*Personality Not Includedâ€ exists in equal measure as a text book new marketing students will find themselves hiding behind the jackets of stodgy, traditional marketing tomes; and as a vital “how-to guide” for rapid cultivation of something many corporations will be embarrassed to admit they may have never had. Students and kings of industry alike are encouraged to hold this book close at bay. I have heard about this book, but have yet to get my hands on a copy. Sounds like I should, since I’m struggling with my brand and how to establish myself in the incredibly saturated market of books. Its interesting, because I already do a lot of what is called “Karmic marketing” without knowing that is what it is, and it has payed off. Now I’ll have to try the other suggestions. Thanks for the great review.